Personalized God Boxes, Custom Laser Engraved Trinket Boxes and Keepsake Boxes at WoodenUrecover.com! In addition to being beautiful trinket boxes, these heirloom quality keepsake boxes have a magical way of alleviating anxieties, fears, and doubts. The idea behind a God Box is simple. Write down the thoughts, concerns, worries, resentments, situations, things, etc. that you find are beyond your control or that you no longer wish to have your thoughts focused on. Write them down and place them in the box for God to handle. Write letters to people and things that don't serve you anymore and put them into your box. A God Box is about putting worries in stronger hands, and letting go. 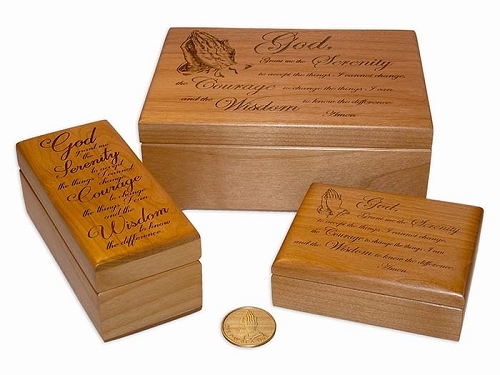 These beautiful trinket boxes can be laser engraved with nearly any art, message, prayer, etc. that you desire. If you have an idea for a special God Box, please Contact Us. We love working on special projects!